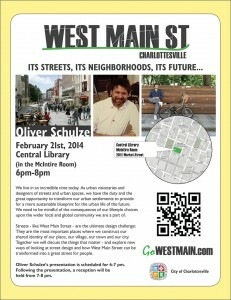 Come join us along with Oliver Schultze to gain insights into international streetscape design. Streets – like West Main Street – are the ultimate design challenge: They are the most important places where we construct our shared identity of our place, our village, our town and our city. Main streets were brought to life to serve many vital purposes in real communities but over time they have become less attractive and increasingly served the interest of passing commuter traffic, often at the expense of local communities. Together we will discuss the things that matter – and explore new ways of looking at street design and how West Main Street can be transformed into a great street for people. Following Oliver’s presentation (6-7 pm). A reception will be held from 7-8 pm. This entry was posted in Latest News on February 5, 2014 by admin.